The Seattle Transportation Benefit District, a 6-year levy to fund additional bus service in the city, is approaching middle age. According to the city’s latest annual report, the district is coming to terms with its advancing years in the way most of us do: making incremental improvements, adapting to a changing economic realities, and trying to leave a legacy for the next generation. Passed in 2014 at the nadir of Metro’s finances as a last-ditch effort to avoid service cuts, the levy is now being used to improve service and fulfill the city’s goal of having 75% of households living within 10-minute or better transit service (which the city defines as an average of 10 minutes between 6am and 7pm). This year, with a labor shortage limiting Metro’s ability to get more vehicles on the road, the Seattle City Council amended the levy to include capital expenditures and subsidized ORCA cards for students. 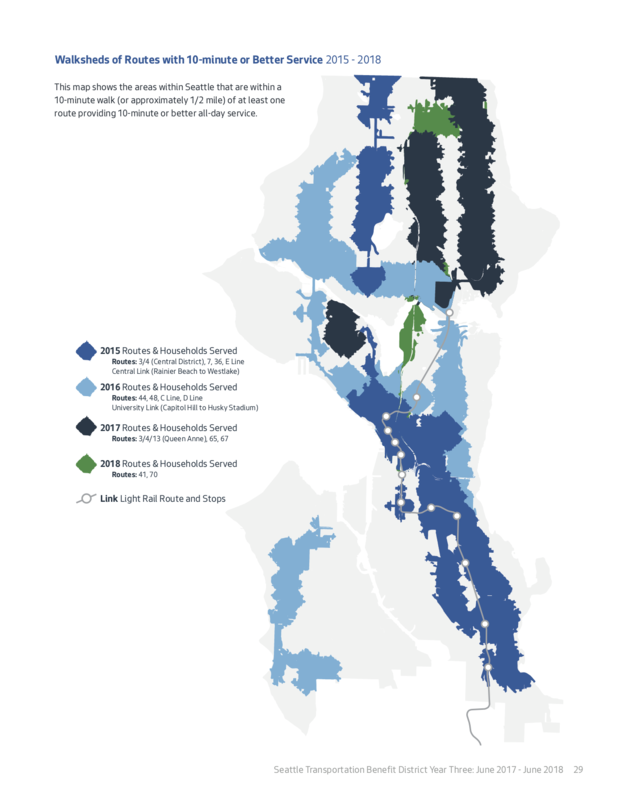 As of this year, 67% of Seattle households have access to 10-minute transit service, up from 64% last year and 25% at the beginning of the levy. The city had hoped to hit 75% by 2025, now it seems likely it will reach that number several years early. This year’s big additions are the 41 and the 70, filling in 10-minute service gaps in Northeast Seattle and Eastlake. Notable remaining gaps include Delridge (The 120/H is now eligible for TBD money due to the city’s relaxation of the rules this year) and Georgetown (the 60 now has 15-minute service, the 124 is eligible for more). West Seattle’s geographically-challenged Admiral neighborhood, a designated urban village, also lacks 10-minute service, as does Magnolia (which has no official urban villages). Of course, there are goals beyond just hitting the high-ridership routes. The kind of transit network that’s going to get you to give up your car can’t just go downtown during business hours, it needs to go cross-town and operate 24/7. So the city is buying service on evening routes and neighborhood feeders that don’t have the highest ridership but make the overall system more useful to more people. Likewise, the levy adds service in low-income and transit-dependent communities. Improving any transit service relies on a positive feedback loop: riders generate political support for better service, which in turn creates more riders. Once Metro’s finances improved, the TBD allowed the city and Metro to flood the zone with bus service, leading to increased ridership. Before 2015, many Seattle residents couldn’t even imagine using the bus: it didn’t come often enough and didn’t take them where they wanted to go. That’s not the case anymore. With TBD approaching the end of its life in 2020-2021, it’s time to start thinking about the next levy, on which the city and the county may partner. Now that capital improvements are back on the table, it’s a good time to think about projects that will make the buses faster. I very much appreciate the 15-minute headway on route 60 during the daytime weekdays. As I’ve pointed out a few times, the 15-minute headway between Beacon Hill Station and Georgetown could be extended to most of the evening and all day on weekends just through minor schedule adjustments, with investment limited to extending some breaks in order to keep routes 60 and 107 (which each run half-hourly, but often pre-bunched) timed to alternate roughly evenly in both directions on 15th Ave S.
Route 107 also runs roughly every 15 minutes during peak periods. If routes 60 and 107 could get minor scheduling adjustments during those times, 15th Ave S could have roughly 7.5-minute headway during that time. Sadly, 60s and 107s tend to be pre-bunched, by schedule, through most of the evening and portions of peak. So, one comes along, gets crushloaded (or close to standing-room-only during the evening), and the next one runs almost empty behind it. For purposes of serving riders trying to get to or from Beacon Hill Station without a 30-minute wait, they are scheduled like routes 71/72/73 use to be scheduled after an auditor failed to notice they are branches on a trunk, and Metro didn’t bother to make the auditor aware of this detail. For very little additional investment, bus service frequency on 15th Ave S could appear to double. I’d love for the City to talk to Metro about making that happen. Metro is doing some short term base optimizations to get them through 2021 and then will be expanding their base capacity by 2025 and beyond. Has Metro said why it can’t expand base capacity sooner? I assume they aren’t just delaying so that they can reduce service after each Link extension opens, since their long-range plan indicates they want to increase service. I think it’s just a matter of acquiring the real estate and building out the facilities. Limiting the funds to adding service was an overreaction to You-Know-Who, who said he would campaign against the measure if any of the money could be spent on rail projects. But since the council has found its courage, it would be nice to use some of those funds to buy more streetcars, so we can have something approaching frequent service on the First Hill Streetcar line. We spent nine figures installing tracks and other capital improvements, and then cheaped out on buying livery, reducing the utility of the tracks significantly. The way-too-long wait between streetcars is a major reason I almost never ride it. We need only look south to the Tacoma Link streetcar to see what increasing headway on a short streetcar line does to ridership. That line is one of several serving that path, and serves less density than the FHSC serves. The universities the FHSC serve are each larger than UW Tacoma. There are a lot more major businesses along Broadway than in what is left of downtown Tacoma. The FHSC ought to be significantly more frequent than the TLS. As an aside, since the City sets fares on the streetcars, the City can decide to reduce the fare to $1 for youth and LIFT passengers, matching the RRFP fare. Do it if only to set an example to Metro, and see if that actually helps ridership. Consider also investing in more streetcar service hours, if it does not get in the way of the maintenance schedule. If the City can get it together on making the FHSC useful, then a lot of money could be saved on First Hill Express buses that might not be needed after Northgate Link opens. Buying more streetcars is very expensive. Not only do the streetcars, themselves, cost much more than buses do, while offering essentially the same capacity. But, more streetcars also requires more land for the maintenance barn to store them overnight. Furthermore, such land has to be somewhere in First Hill, Capital Hill, or downtown Seattle, since that’s where the tracks go. The land to build the barn to store the streetcar overnight can easily cost more than the streetcar, itself. By contrast, if you want to boost First Hill streetcar service on the cheap, the way to do it would be to just run buses along the streetcar tracks, and have the headsign simply say “streetcar”. Unlike actual streetcars, buses can be stored and cleaned out in the suburbs, where land is cheap, and driven back and forth between the base and service area, along the freeway. Yeah, there is no reason why Metro couldn’t just overlap the existing streetcar route with a bus. They wouldn’t need to run any wire (since the route follows a low grade, by its very nature). It could go farther up Broadway as well. My guess is Metro doesn’t do this, because it simply isn’t a priority. Other buses provide similar connections. If I just want to go up or down Broadway a few blocks (e. g. from Madison to John) I will take the streetcar or the 60, whichever comes first. If I’m on Jackson trying to get downtown, it is a similar thing. A big part of the problem is that the streetcar route is just a bad route. If it was a bus route it would be bad. It is short, curvy, and somewhat redundant. The number of unique connections are few, and the number of unique connections that are faster than walking are even fewer. It isn’t the only flawed route in the area, as buses fail to provide a meaningful grid, while spending way too much time making turns. The area is begging for a meaningful restructure, and it remains to be seen if such a restructure will make the streetcar more or less important. In the meantime, though, I don’t think Metro (or the city) considers that particular route a priority. During peak, add buses to match Link’s 6-minute headway, and provide signage so people know where to wait for whichever mode is coming next. That should require about 4-5 buses each peak period. Roll this out by 2021, and keep it going for at least a year after Northgate Link opens to see if ridership goes up significantly. Buses will, of course, need their own dwell space and a path for turning around beyond the streetcar terminals. FWIW, having lived near the First Hill streetcar for a year and riding it several times a week, the times I didn’t ride it was when there was too long of a wait between trains. And NOT because of the routing. The turns at 14th ST and Yesler are unfortunate and partly a function of the topography, but lack of signal priority is what really slows down the trains. Just like with driving in city traffic, your average speed is more a function of traffic lights than peak speed and even to some extent distance. Still, this was something I could put up with, whereas the poor frequency really was a turn off that made me ride it less. I don’t get the logic of building a train through a dense and gentrifying neighborhood and running it with less frequency than the busses. Just don’t get it…. And due to the shortness of the route, it would only require having a couple more streetcars, whereas longer bus routes might require more vehicle purchases (and driver hours) to significantly increase the frequency. PS you can’t just run busses on the FH streetcar because as of now Metro doesn’t have busses with left side doors, left doors that also do quick wheelchair boarding, and it is reportedly not that easy to acquire them for Madison Rapidride. @B — I’m not sure why the streetcars don’t run more often, but I think it is a combination of drivers and vehicles. During rush hour, it runs every 10 minutes. In the middle of the day it runs every 12 minutes. In the evening it runs every 18 minutes, transitioning to every 25 minutes late at night. (https://seattlestreetcar.org/how-to-ride/first-hill-line/). This means that during the day, it is about the drivers. Trains must be sitting idle outside of rush hour. So, if they had more drivers, they could have more midday service. But getting better than ten minute service during rush hour would require more trains, or somehow making them run faster. The same could be said for buses as well. Outside of rush hour, a lot of buses sit idle. So again, more buses would be needed to increase rush hour service (perhaps), but not midday service (where you just need more drivers). I don’t get the logic of building a train through a dense and gentrifying neighborhood and running it with less frequency than the buses. First of all, it doesn’t run less frequently than the buses. It runs less frequently than some buses. The 47 — a short, urban trolley, probably the most similar bus to the streetcar — runs every 35 minutes or so in the middle of the day, or roughly half as often. Buses like the 12 or 60 run every 15 minutes (or just a tad worse). So it really isn’t any worse, nor is it any better. To be clear, there are some very frequent buses, but those buses tend to have far more straightforward routes. The 3/4 may be slow in places, but it basically just keeps going the same basic direction. The streetcar reminds me of the 24, winding its way around, which means that for many trips (e. g. Yesler Terrace to downtown) it makes more sense to walk. Of course the abrupt ending also is flawed, making for a transfer. The extension is meant to fix this, but that would mean that you could exit the streetcar, walk down the street, and catch the streetcar again (after a bit of a wait) even when traffic is light. It is tough to do that on many routes. As for logic, there just isn’t a lot as far as the Seattle streetcars are concerned. The streetcars themselves are tiny, which means they can’t carry more than our bigger buses. That right there is illogical. The only transit advantage of streetcars is that big ones can carry more riders than buses, yet ours don’t. It would be like running Link with trains the size of buses — not much point in that. 15 minutes is a long time to wait for a streetcar in a neighborhood as dense as First Hill, Little Saigon, or SLU. On Jackson Street it doesn’t matter as much because parallel buses come every five minutes, but then… why do we have a streetcar if it’s not the most frequent and primary transit vehicle in the corridor? A streetcar says “Use me”, and the neighborhoods’ density and mixed-use says “A train should come every 5-10 minutes”. Considering Mayor Durkan is mum on the CCC and appears to be hoping it will quietly die unnoticed, I doubt more streetcar hours are on the table, but you never know. My guess is she is waiting to hire a new SDOT chief before making a decision on the streetcar. I would say this is a reasonable approach (she also do the same as far as making recommendations for ST3 station locations as well). The city desperately needs someone who knows a thing or two about transit (and can spend the time digging into the details). Right now her instincts are right (the project, like so many in this city, were really messed up) but doesn’t know how best to move forward. But yeah, there is no way they are buying more streetcars in the meantime. The political cycle sure makes a mess of transit progress. Every mayor wants to choose their own SDOT director. Every mayor since Nickles has failed to get re-elected. His two terms were an anomaly, and he got voted out, too. We are spending too much time unable to move forward with transit projects for lack of a relatively permanent SDOT director. You’re right, Durkin is only a fan of 3rd world public transpo and wants to mothball the CC and eventually the FHSC. However, politically she realizes if she chooses to go this path she will alienate many of her constituents and will also violate agreements on maintaining FHSC which will set herself up for lawsuits. Hence she has “renewed its application for $75 million in federal funding” and has left herself an out. Several third-world countries have real bus rapid transit, some have more extensive subways, and some have gondolas and public escalators in hilly areas. They wouldn’t even look at building a streetcar stuck in traffic because it wouldn’t address any of their transportation problems. The political cycle sure makes a mess of transit progress. Every mayor since Nickles has failed to get re-elected. I agree, but I think the problem goes beyond that. You don’t need to replace the SDOT director. Crunican (who served under Nickels) resigned before McGinn took office. McGinn was unqualified to be mayor, so it is not that surprising that she left before he took office. While McGinn had a lot of problems with his administration, Hahn was certainly qualified, and was probably worth keeping (since he had only been there four years). Murray, on the other hand, didn’t want that, and hired a guy that was more show than substance (two peas in a pod, I guess). If the scandal about Murray weren’t made public, then we would have been stuck with Kubly. I suppose Kubly could have taken the fall for the biggest transportation debacle in the region, but they both were responsible. In other words, if I was major, I would have fired him, while I would have kept any of the other three. Yes, it is disruptive to make a change, but it is even worse to hire someone who lies to the public, and thus jeopardizes the type of projects mentioned in this post. We have already voted for more service, and Metro is, by and large, delivering it. Sure, there are problems hiring enough drivers, but those problems are exaggerated (as we keep adding service). But the major improvements in speed — the ones that would enable much higher levels of service without more drivers — were sabotaged by Kubly and Murray. If you think the mayor has struggled with the situation now, just imagine Murray, who have had to own this mess. Significant overruns for the streetcar project, along with huge overruns for MoveSeattle. They simply don’t have the funding for half of what they promised to build — and they knew it! They knew it was a problem, but just swept it under the run, thus making it harder for anyone, in the future, to be trusted on the subject. They make the yahoos at the Seattle Times look sensible, because, in this case, they were right! So yeah, it is a problem that we keep changing directors. But the bigger problem is that the previous administration, and the previous head of transportation, were corrupt. McGinn was a good mayor, as good as Nickels and Schell, and better than Murray or Durkan (so far). He just had different priorities and style than his predecessors. Most of the opposition against him was from people who supported the 99 tunnel and restrictive zoning, opposed road diets, etc — they just disagreed with his priorities, but instead of just saying that they argued he was a bad mayor and couldn’t get along with people and railroaded his policies through. It’s hard to get along with people who don’t want to get along with you and want to impede your program. It’s no different than saying Obama was the worst president in history, Clinton was an unqualified and irresponsible secretary of state, and Nancy Pelosi shouldn’t be speaker because she’s the feminine Karl Marx — it’s all just a dirt smokescreen. McGinn may have had social-adeptness flaws but they didn’t rise to a fraction of the level of the criticism levied against him. No, Mike, it wasn’t about priorities. It was about his abilities. Look, you and I might agree on every major issue, but you don’t want to vote me in as mayor. City council member? Sure. But mayor? Hell no. I simply lack the necessary administrative experience. Peter Hahn was one of the few people that McGinn appointed that knew his stuff. Transportation was more or less OK. That wasn’t the problem, and rarely is it the biggest problem with any city. First priority is the cops, and when that became obvious, he was like a deer in the headlights. He simply had no idea how to handle the situation. Meanwhile, every person I’ve talked to at the city said he was simply enamored with his biking buddies, and put them in positions for which they were unqualified. Granted, that is just anecdotal hearsay, but given his history, not that surprising. He had essentially no administrative or major political experience. He didn’t know how things were run, nor had ever been responsible for something even close to that big. That doesn’t preclude him from doing a good job; he could recognize that fact and appoint people with the necessary experience to push towards his vision. But that is rare, as most people who understand they aren’t the best person for the job simply don’t run. “Several third-world countries have real bus rapid transit” which proves my point. And btw, Bogota is planning to replace significant parts of its BRT with Metro. And not a moment too soon! Regardless of the various mayors’ qualifications and skills, and Murray’s other serious faults (to put it kindly), it was Murray who gave us the STBD that is the topic of this post. It was also a deft response to an effort by a former STB writer (who Mayor Murray also publicly trashed) to push a property tax for more city bus service. Thank you, Ben Schiendelman, for probably causing the STBD to happen! Frank: TBD is a six-year program, not seven. Thanks, fixed. The fact that it goes until the spring 2021 service change always trips me up. To piggy-back: The 2025 10-minute goal is 72%, not 75%. The TBD excluded streetcars. The two lines do not help address the 75 percent and 10-minute headway objective as its travel sheds are already served by frequent transit (e.g., routes 3-4, 7-14-36, and 40-70). The FHSC line was supposed to provide 10-minute headway. The FHSC line could be served by electric trolley bus via the turnaround loops at East Aloha Street and 2nd Avenue South, but ST made a mode choice, not a service choice. The ETB would be faster, as it would not deviate to 14th Avenue South; it would provide better frequency on South Jackson Street, as it would serve the outside stops and not unique inside stops. but those choices were already made by the ST board and mayors Nickels, McGinn, and Murray. Mayor Durkan holds the mess. There are many worthy off-peak frequency investments that could be made; there are also worthy capital projects to speed up buses or better connect with Link stations. Back to the FHSC, perhaps Seattle should turnback them back at 5th Avenue South so that it might better achieve the promised and not delivered 10-minute headway. the actual running times are much longer than SDOT forecast. ST made the mode choice that First Hill activists demanded. It felt it had to do something to mitigate deleting First Hill Station. ST didn’t look at what First Hill needed long-term because that’s outside its mandate; Metro and the city are responsible for local transit on First Hill. The city pushed for the First Hill Streetcar proposal as if it would help. It was apparently thinking of Sounder riders going to jobs around Swedish. Why the city didn’t ask ST to dump the money into Madison RapidRide instead is a good question. It seems to be because of the city’s vision of a wider streetcar network. Never mind that a streetcar network of the speed of the first two lines would not help Seattle’s mobility at all and leave it with the existing problems remaining. ST boardmember Nickels seemed to have led the mode choice. A faux study was done in 2006. First Hill activists got involved later when SDOT conducted outreach about which pathway to use. A Madison line was in the 2006 study, but it did not spend equal amounts of funds on the various options. Nickels spearheaded the First Hill streetcar??? Why in hell would a citywide mayor think that a streetcar in that corridor was a good idea? And above Madison BRT? Ayayay! We could extend the Madison line down to the Sounder station if that connection was so important. Was he already thinking about the CCC? If so, maybe we should have just built the CCC then. Ah, but it might not have gotten the transit lanes then. Did Nickels start thinking about this line before or after First Hill Station was deleted? the city’s vision then of a wider streetcar network. Murray reversed course and shelved the plans for a 40 and 70 streetcar and any idea of a 7-Mt Baker. Instead he threw all the streetcar frenzy into the CCC. Actually, SDOT data shows that the streetcars actually run faster than the busses on Broadway, so the narrative of busses-are-faster is not necessarily true. You could shave off some time by making the turn on 12th instead of 14th, but with running slower on Broadway, you may not net much time savings at all. At best, it’s speculative whether busses would run the route faster. Especially if SDOT follows through on the efforts to improve streetcar signal priority. If a bus ran the exact same route as the streetcar, why would the streetcar be faster? Off board payment? Sure, but the bus could have that. Level boarding? Ditto. There simply is no speed advantage to streetcars — it is the opposite. A bus driver has the flexibility to avoid a problem (like a car in a bus lane a few inches) while a streetcar doesn’t. The only transit advantage with a streetcar is that some streetcars (although not ours) have larger capacity. However, in Seattle we simply don’t need that extra capacity on any corridor (or, to be more exact, any corridor not being served by Link). The only corridor that approaches that is downtown, but downtown is also a natural transit confluence, thus there is no advantage to running a streetcar there *in addition to* the buses that have to move through there. I suppose in theory you could just end all the buses on the edge of downtown, forcing people to transfer, but that would be horribly unpopular, and would likely require much bigger streetcars running a lot more often. Eastlake or Westlake are those types of corridors, it is just that they simply don’t have the demand. There aren’t huge numbers of potential riders there (enough to justify the disadvantages of a streetcar). You need lots more people (like Toronto or Paris) and the only place we even come close to that is downtown (where we have literally more than enough buses). Streetcars only make sense in a very limited set of areas, and Seattle just doesn’t have that. That may be true, but what really irks riders is not the speed on Broadway but the 30-second wait before each of the turns in the P-trap, and the SLU streetcar stopping every single block at stoplights between Westlake and Denny. @les — Third World public transit? Not sure what you mean. You think there is a correspondence between trams and wealth? Hmmm. Does North Korea count as Third World (or is that second world?). North Korea has trams in a couple of their cities. South Korea abandoned their tram system once they built their subway. China also has trams. So does India, Nigeria, Algeria, Brazil. They are pretty common worldwide (usually built a long time ago). They are even common in the U. S., although usually they aren’t built to provide a transit need, but for other reasons (e. g. to spur development). Cincinnati has a streetcar line — it carries about 2,000 people a day. Does Cincinnati count as Third World (I guess it depends on the neighborhood). All of those places have buses too, of course. Just about every city has buses (rich or poor). Some have a subway system, some don’t, but they all have buses. As for the mayor’s taste in transit, my guess is she simply prefers transit that works. In a city like Seattle, that means a subway system along with buses (we simply lack a corridor appropriate for a tram). Focusing on building what makes the most sense to build is a solid approach to take (and one that should have been taken a long time ago). 3rd world transit at its finest. Yeah, Australia doesn’t have anything in the way of BRT. Oh wait, yest they do: https://www.youtube.com/watch?v=IcUSOP_UcIo. Meanwhile, the developing world only uses buses. Except, or course, for the countries that also have rail. Dude, I get it. You love trams. Wonderful. But there is simply no correlation between wealth and trams. New York has the best transit system in North America, but no trams. Vancouver is clearly the leader in the Northwest, and no trams. They have buses, and they have subways, but no trams. Trams are a niche market, making sense only when you have the density required for them to be preferable to buses, but not the money for an additional subway line. That is why most trams are old, and cities — even wealthy ones — rarely rebuild them. OK, they have become common, but rarely can you point to a streetcar line and say that it was a great investment, the way that you can with either bus improvements or a subway. Seattle just doesn’t have a corridor that makes sense for them. Very few cities do (and you are as likely to find them in poor countries as in rich). “Volvo Research and Education Foundation”. Who would of thunk that Volvo of all corporations would be interested in BRT…go figure. “Trams are a niche market”. I have to give you credit here, you’ve finally figured this out! “OK, they have become common”. Yes, you’re expanding your realm. Congratulations! “Seattle just doesn’t have a corridor”.. Uh oh, you’re regression is beyond repair. I have to give you some credit though! You’re finally making some sense after all these years and I take my hat off to you! Right. Because big money interests would never be into pushing an inappropriate mode just for the sake of profit. Dude, Australia really is a leader in BRT systems: https://humantransit.org/2009/11/brisbane-bus-rapid-transit-soars.html. Feel free to dismiss Mr. Walker as merely a shill working for “Big Bus”. not-at-all-BRT RapidRide E carries (around 17,000 a day). The Portland lines carry way more than the other streetcars you mentioned. Meanwhile, the flagship service — the best one you could come up with to counter my argument — runs “at 15-minute intervals at most times, with a 20-minute frequency in the evening and on Sundays.” Not every five minutes, or every three minutes. Not anywhere near saturation point — i. e. the point at which streetcars make sense. No, not even close. There are only a handful of routes in North America that even come close to that, and as it turns out, the bus route I mentioned earlier (you know, the one that carries more riders than all of the new North American streetcars combined) is one of them. Converting the 99-B to a streetcar is a very reasonable thing to do. Except Vancouver won’t do that. Because Vancouver, unlike, say, a Third World country, can afford to do the right thing, and convert it to a subway line. 1) You need the capacity. 2) You are running on an existing line. In Seattle, there simply is no independent corridor that requires the capacity. The only one that comes close is downtown, bus it is also a major bus confluence. The buses that run on Third Avenue carry 100,000 people, but it isn’t just one bus route. It is a series of overlapping buses that, for the convenience of the riders, travels from one end of downtown to the other. Of course there are thousands of riders who just use it to get from one end of downtown to the other (enjoying a service that would be the envy of every Portland streetcar user) but there are many more who are simply boarding or ending their journey there. It would be ridiculous to replace that segment with a streetcar. That is the point. There simply is no route that makes sense for a streetcar in Seattle. The downtown routes (the numbered avenues) already have *more than enough* buses. Westlake and Eastlake aren’t there yet in terms of density, nor will they ever be. Madison is a bit better, but the hills are a problem for streetcars (and Madison isn’t expected to reach saturation point either). It just doesn’t make sense for Seattle, just as it doesn’t make sense for most U. S. cities. Look at those tram lanes and signal priority in Melbourne! SDOT, are you listenint? I have no idea what Les is trying to say because he seems to be saying two opposite things simultaneously. I’m concerned about trying to pass a county wide proposal again. I am quite confident that it would pass in Seattle, but I’m not so sure about the county. They could try the same approach as last time (try and pass a county proposal, and if that fails, pass it in the city) but that has its drawbacks. Special elections tend to have lower turnout, and the voters tend to more tax averse. So the best chance of passing a county wide proposal is the general election in a couple years. But if that fails, they will have to pass a city wide one in a special election (which, again might not be that difficult, but still). Of course there are probably areas on the East Side (Bellevue, Redmond, maybe Kirkland) that would pass a proposal, while others (Sammamish, unincorporated areas) that would likely vote against it. A city by city approach would be messy, but might be the best one. Meanwhile, the city also has to figure out what to do about the Move Seattle mess. That is where the major speed improvements were supposed to happen. The city needs to work towards regaining the trust of the voters. Having a new administration helps, but it won’t be easy. Asking voters to approve something they are paying for, but thought they were going to get a few years ago is always tough. The need is still there; folks still want it; it just isn’t clear whether they trust the new administration to deliver it, when the previous one simply lied to us. I also am concerned about a countywide measure failing, as the last two have done. Metro has an ambitious long-range plan with twenty more RapidRide lines in the core corridors and half-hourly expresses to fill in the regional-transit gaps, but it requires a Move King County or significant cities’ funding. Seattle is enthusiastic, the Eastside probably so, but South King County thinks it’s too poor for additional transit taxes. Seattle needs to have a backup in place and not try to put one together after a county failure, which could possibly leave a gap and reverse the new evening frequency on the 5, 8, 10, 40, etc. Link? I can’t find it. Solution for the homelessness crisis. I believe Mrtro jobs are pretty good jobs. If these homeless individuals are as decent as people say, then they should be willing to jump at this opportunity. Am I missing something? You have to be qualified to drive a commercial vehicle. And those with mental-health problems or drug addictions that interfere with driving need not apply. The labor is all busy doing construction. And that’s only half the problem. The other half is a lack of space at the bus barns for more buses. Metro is siting a new base but it’s slow, probably due to bureaucracy and the lack of large empty spaces that don’t fetch more money for buildings. Then Metro may not be able to scale up to hiring and training a lot of people at once. It has been through a yo-yo the past two decades as revenue has gone up and down with the economy and tax-cutting initiatives, sending Metro through waves of layoffs and hires. The last layoff wave was just four years ago. Is Metro looking in to going driverless? I hate to say it, but cost of living isn’t likely to come down enough to make transit bus driver be a career one can live off anywhere within a reasonable commute. Unless we’re talking increasing driver pay *a lot*. Driverless at the moment depends on having 100% dedicated right of way, which as we’ve seen is a herculean effort in this town, and not infrequently Sysiphean. Driverless tech is not good enough for running in general traffic yet. And that doesn’t even get into the issues with ADA requirements and number of other reasons we have human drivers. Link outside of the Rainier Valley segment is about the only transit mode in this city that might be good for automation, and I still think that’s not a good idea. Metro may be able to convert one route to driverless by 2035, if it put a RapidRide level of capital into mapping out all the potential hazards on the street and mitigating them through dedicated lanes and block-by-block software hints, but there’s no way it can convert all of its routes to it in even a 30-year plan. If we can find barely enough workers for Amazon’s needs and construction and light rail rollout and bus drivers, where are we going to find the massive number of workers to map out every block on Metro’s network and identify the hazards and miigate them. And how will driverless buses deal with snow and black ice? The thing with homelessness, is that it’s actually not usually the problem. In cases where it is, it is relatively easy to help people. Many homeless have mental issues or addiction problems, and have no reasonable chance of being self-sufficient in this city. If we want them off the streets, we are going to have to build them homes and give them money to live. The thing with homelessness, is that it’s actually not usually the problem. In cases where it is, it is relatively easy to help people. Really? I mean, if someone is just poor, and living in their car, are you saying help is easy? That hasn’t been my experience at all (knowing someone who had no addition or mental health issues, but was simply broke, and not very employable). Speaking of which, driving a bus is hard. First of all, simply qualifying is hard. You have to have retail experience, which eliminates some people. Then you have to manage a huge vehicle. Meanwhile, you have to actually want to do it. I would have to be very poor and desperate to do that (I think I would rather work fast food — I guess that would get me some of the needed retail experience). That is really the big issue here — not enough people want to do the job, and some of the folks who want to do it, and could probably do a pretty good job don’t qualify. If you have driven truck for a while and want to switch over, it seems like a pretty straightforward, logical change. But unless you spent time in retail, you wouldn’t qualify. Part of the reasoning, I’m sure, is that drivers are supposed to collect payment. It is more than that, of course (drivers often have to deal with messy situations) but if bus drivers were more like train drivers (just drive and let the someone else deal with the fare collection) then maybe we could have more drivers. You would need more fare collectors, but not that many, and there seem to be an overabundance of folks willing to work as fare collectors. Thus going to an all off board payment system might ease the driver shortage (if the hiring rules also changed). The question is what led to the homelessness. A person who lost a job can find another job. A person who has no skills, education, or a criminal history is going to have tough time, but they can be helped because they are in a state of mind that could lead to self-sufficiency. For every secret genius on the streets who can become a wiz programmer at a tech company, there are probably two hundred people who due to health issues who are probably unemployable at a wage that could secure them housing. A person who is mentally ill to the point of living on the streets is fundamentally a disabled person. That person will probably not find a well paying job in Seattle anytime in the immediate future. This is an expensive city that leaves few options. The program that will solve it, if the city, state and nation want to solve it, is to give the people who are incapable of caring for themselves, for whatever reason, a home and income. Fun fact: a $15 minimum wage yields $30,600 per year (before taxes, assuming one week of unpaid holidays, at 40 hours per week). You need $54,000 to rent a $1500 apartment if the manager is strict about requiring an income three times the rent. Our friend on minimum wage could get an apartment for $850. When I left my Summit studio in 2010 it was around $750 (no parking, 348 sq ft), and my friend in a similar unit in St Ingbert paid around $810 (not sure if parking was bundled). Since then average rents have risen 60%, and while I don’t know if those units have broken a thousand yet, they’re certainly above what our minimum-wage friend can pay, and there are very few units even at that level, and they’re all certainly filled. And if he works outside Seattle or at a small company that hasn’t reached $15 yet, the gap is even more stark. In the 60s and 70s people with barely any money lived in SROs but those are illegal now and only one or two descendants remain, with maybe thirty units total, not thousands. In the 80s minimum wage could still get you an apartment in the northern U-District, but not now. @Brad A person who has no skills, education, or a criminal history is going to have tough time, but they can be helped because they are in a state of mind that could lead to self-sufficiency. Yes, but my point is that they aren’t being helped. They don’t have the skills to bounce back quickly in this era. Fifty years ago (assuming they were white) they could have found a good job in a factory, or some other low skilled position (and many who weren’t white found jobs that way as well). But now, those jobs simply aren’t there. The wealth isn’t there either. They are living paycheck to paycheck, so that when they lose their job, they have no place to live, and are too busy trying to figure out how to get their next meal to find the time to acquire the skills to compete in the modern workplace. Yes, those folks are easy to help — and in other countries they do help them — but in the U. S., we simply don’t. As for folks who are worse off, we do very little for them, because helping them is even tougher (and more expensive in the short run). Folks know how to improve the situation (in both cases) and you are absolutely right (in what you outlined). But we won’t do it, because we have are still within the era of right wing extremism, which started with the election of Reagan (which ended the era of moderation, which started with FDR). This right wing period has seen a dismantling of generally bipartisan approaches to solving social ills, and in its place a return to laissez faire, gilded age policies. Instead of the approach that lead to the greatest middle class the world has ever seen, we have seen middle class regression along with empty platitudes about bootstraps. The war on poverty was replaced with a war on drugs, which was, after all, designed by Haldeman as a means to limit the political power of hippies and blacks (once they were thrown in jail, they couldn’t vote). That, in turn, became the prison industrial complex, which not only drained the coffers of many a state government (at a time when the federal government moved funding responsibility to the states) but it ravaged a generation of those just barely scratching their way out of poverty. Add in a couple wars that make Vietnam sound downright sensible, huge tax cuts that have gone to a relatively tiny few, and it really isn’t that surprising that we can’t solve problems that are fairly obvious (as you suggest). If they don’t have stable housing, they can’t get stable jobs. That’s the whole problem (and given that in this metro area if you don’t make upwards of $60,000 or already own a home outright you don’t have truly stable housing anyways). Some 30% of homeless people have mental-health issues that preclude them from having a stable job in any case. That percentage may gradually be decreasing as more middle-class families become homeless, but it’s still high, because the reason the mentally-ill homeless exist is they lost their instututional housing in the 80s and the community services that were supposed to replace them never materialized. You got the general narrative correct but the deinstitutionalization movement actually began in the late 60s and continued throughout the 70s. I think this archived NYT piece from 1984 is a pretty accurate post-mortem. In the 70s homelessness was seen as a “New York City problem”. There weren’t large numbers of homeless people here until the mid 80s. You could be right about when the institutions started closing but then there was a 20-year gap before it became manifest on Seattle’s streets or most of the country. Thanks for the link – very informative. It would be sad if Seattle sank back into half-hourly or hourly buses because state residents love anything shiny saying “Low car tabs” or “No fossil-fuel taxes”. It would just force more people who don’t want to or can barely afford to to buy cars and drive. Unless I’m mistaken, I-976 would not affect voter-approved car tab fees like those under STBD. Isn’t that the point though? #1 To roll back the ST3 MVET.. #2 to roll back other MVETs like STBD. Isn’t that what people mean by “Car tabs are too high”? Has the state’s MVET gone back to high too? Or that he thought he had it so deep in the bag he didn’t bother to campaign very hard. Qualified man either didn’t want the job or thought it was already his. The one who honestly thought it was his duty as a citizen to run- at least he gets credit for running for it when nobody else did. I voted for him next election, too, just for that reason. Anybody who thinks I should have voted for his successor…credit for the Deep Bore Tunnel and its construction record’s yours. Or, all three of us had another course of action: Run for office against both of them. Whatever all three of us deserved, we’d all have gotten all of it. Nickels was primaried because of the snowstorm as Schell was earlier, and because of strategic voting by people who liked Nickels but voted for somebody else thinking Nickels would at least get the second primary slot and they could choose between them in the final. The Stranger recommended that approach and too many people did it, so Nickels came in third and was out. Ah, those were the days, when “primary” wasn’t a verb. But that’s what happened to Nickels. Er, I’m not sure if Schell was primaried, but the biggest immediate bloc of voters against him were people angry that he didn’t buy snowplows and salt the roads. Whether they were more numerous than the long-term anti-developer anti-downtown crowd is hard to say. But it certainly seems likely that if he had bought snowplows and salted the roads he would have remained in office. Yes, incumbent Mayor Schell did not survive his re-election primary. As a one-term mayor he got quite a few things done but was stung badly by the handling of the WTO and Mardi Gras melees. Hate the term “primaried” worse than you do, Mike, because it carries the idea that long before the election, one candidate becomes the legitimate one, making every competitor in their own party a traitor. And forever blamed if the anointed one loses- no matter how bad they deserved it. But hate a million times worse the way both the media and the parties themselves start and continue issuing many times more fund-raising reports than other reasons to support them, like competence and character. And as the going gets going, party leaders start pointedly suggesting that a candidate not bringing in enough money had better get out of the way if they don’t want a defeat to be their fault, and therefore losing whatever help the ever got from their own party forever. Especially if they win. Really think corruption stunk less- think Irish whiskey on the bar floor, well-chewed cheap cigars- and those brass bowls. y’know? on the floor when bribes were really just fees for service and signing bonuses. And also a performance bond. If your brother screwed up, everybody including the Mayor and every fish at the bottom of the Hudson knew to whom to, well, assign the responsibility. Seem to remember fund-raising success spoke for itself mostly for its persuasive ability. Maybe we could actually develop a harmless vape that actually smells like whiskey and tobacco vintage 1892. Oh yeah (start to say that a lot!) transit-related history that carries excellent explanation of the connection between politics and its workings and methods. As is noted, by its very nature this system had to be unobtrusive, would definitely fit comfortably under the center of First Avenue. Leaving valuable leeway to decide transit fate of the street overhead. Cars must be barrels with living room furniture. .And a giant fan mechanism down at maybe First and Jackson that and pills and pushes the cars up and down from Pioneer Square to the Space Needle! But most of all: Brass lamp on table and decorative brickwork mandatory. Also notice that subways got built really fast because jams were always FOOT traffic. And also that hat nobody in NYC complained about the 300 % for the whole Arts program. Word to the wise.